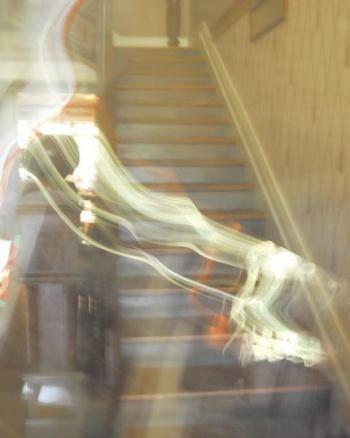 A ghost photo snapped by Dan Whittle. Initially, the family currently living in a historic Murfreesboro home that reportedly has a "spirit" residing there was reluctant to discuss the phenomena publicly. Finally, after encouragement from a mutual friend, the family consented for a reporter/photographer to come for interviews and investigation. Drama about this particular potential ghost sighting had been building since one of the most respected names in Rutherford County shared that he had witnessed something "very unusual" in nature there. As I pulled my vehicle on the property, when stopping the engine, I verbalized a prayer. Don't laugh, I always "pray" before entering dwellings and caves where ghosts are reputed to inhabit. "I have experienced this spirit," testified former Rutherford County Sheriff Truman Jones. "It's not a visual thing, it's a smell … a very strong pungent smell. And it's real." Multiple published paranormal journals indicate that ghosts not only travel, they can appear in multiple locations at the same time. Upon further reading, you'll understand the impertinence of this question. Finally, it was time for the host family to conduct a tour of the beautiful old home that was constructed around America's Civil War period. As the investigative team moved through the first floor of the historic dwelling with brick walls that measure a foot in thickness, I asked homeowner Gordon Bell where the spirit phenomena most often takes place. "Here on the landing, at the foot of the stairs," Bell responded. "That's where the most manifestations occur. We've lived here 17 years now, and the manifestations began then." With that information, I focused my trusty D-50 Nikon with a 55/300 telephoto lens on the stairs, and triggered the camera with its small built-in flash. During my 50-year newspapering career and with my current wildlife photography hobby, I've taken thousands upon thousands of pictures. At this point, nothing unusual or paranormal had manifested. In addition to unusual happenings, history also resides in this home. Upon climbing the stairs, it was there Mr. Bell shared that he has a chest of drawers that once belonged to John Bell … but not the ghost-haunted John Bell of Adams, Tenn.
"This artifact belonged to Mr. John Bell, who ran against President Abraham Lincoln in 1860," Mr. Bell reported. "He ended up marrying a lady who was a relative to the historic Maney family of Murfreesboro. Has spirit Kate, of Bell Witch Cave notoriety, travelled through multiple counties and centuries now to the south, from Robertson to Rutherford County to reside with this branch of the Bell family? "I think its Kate," Truman Jones added as we arrived on second floor. "We don't believe it to be Kate," home owner Bell confirmed. "But we can't account for the phenomena either." "Most of the time, when walking up the stairs, you smell nothing," he added. "But, sometimes within minutes, when walking back down the stairs, the odorous smell will be there … always very strong on or near the stairway." "Have outsiders acknowledged the phenomena?" Bell was asked. "We were having some renovation work done a few years ago, when the foreman called me, saying they had possibly hit a natural gas line or something, because of an odor," Bell answered. "I came home, and there were no gas lines to be found," Bell described. "It was that strange odor that comes out from time-to-time." The family reports the odor appears more frequently when they begin cleaning and preparing to have guests in the homes. "The phenomena increases in frequency when we begin changing things around in the house, and especially when we have guests," Bell added. Former Sheriff Jones, who has the popular "The Truman (talk) Show" on WGNS Radio since his retirement from law enforcement, gave this account of experiencing the odor: "Jackie and I, along with friends, were recently invited to dinner with Sara and Gordon, and that's when we experienced this very pungent and strong smell." Back to the accompanying photograph shown at the top of this account: I was at Walgreens the next day, printing pictures when I was startled to see a very unusual, unexplainable form in the shot I'd taken at the foot of the stairs at the Bell house. My Nikon has never malfunctioned. I have one of the best lens money can buy. In all my years of news photography, I've never had this type of image manifest itself in any of my cameras. Most intriguing to me, is the vision of "vapor" in the left edge of the photograph. What are we seeing in the photograph? I have no answer, but I can verify the photograph has not been altered in any way. For those not familiar with Robertson County's Bell Witch: The legend goes back to the early 1800s, when North Carolina farmer John Bell moved his family to Tennessee where he had a 320-acre farm. In 1817, some of Bell's family began seeing unusual visions, and hearing knocking sounds at night on doors and outside walls of their residence. After a year or more, John Bell finally shared the unusual happenings to a neighbor, and from there word spread and eventually someone advised John Bell the unusual occurrences were coming from a deceased woman named Kate Batts. Thus, the legend of Bell Witch Kate was born. Paranormal experts have published reports, indicating Kate haunted John Bell's house, with the intent of killing John Bell, and keeping his daughter, Betsy, from marrying a neighbor boy named Joshua. Kate reportedly haunted the Bell family almost daily, including episodes where Betsy's hair would be painfully pulled and tugged on. John Bell lived until 1820, when Kate reportedly poisoned him. Word of Kate's shenanigans began spreading throughout Tennessee, and crowds of people began gathering at John Bell's farm and nearby cave, now known as the Bell Witch Cave. Today, a Bell Witch industry has developed that includes multiple movies, videos and books circulating throughout the U.S. and Europe. Has Kate, or a kindred spirit, taken up residence at this Bell family's residence in Rutherford County?